Anyway... A hundred euros (or 114 including shipping) gets me everything I'll need for my first few months of kendo training. A hakama (special pants), a gi (jacket), a shinai (bamboo dueling sword) and a bokken (wooden sword for kata). Oh, and a baggie to put the swords in. That's a pretty good deal, though obviously none of it will be of stellar quality. Still, a hundred bob is certainly manageable as a starting point! Next up, I know it's not required and might be a bit weird, I'll write a short letter requesting our sensei to accept me as a student. Anyway. I learnt a lot today. I still have the same problem as last week, where I strike with my whole arm instead of whipping the shinai with my left wrist. Aside from that I also tend to stoop a little, holding the shinai too low (below navel level). And there's one problem that's obvious for someone completely new to martial arts: I am hesitant to actually strike someone. Today we practiced the basic men strike and the kote-men strikes and only near the end of class would I actually start HITTING people, instead of tapping, glancing or tapping. All my sempai were very helpful and patient, with most everyone having a pointer or two. I enjoy training with this group a lot! At least there's nothing wrong with my kiai. Finally my big lung capacity pays off and I can use my Voice Of Authority(tm) for something else, besides addressing crowds at the 'Anime 200x' festivals. Today I did something new: I partook in kendo training. Recently I've been getting the "itch" to pick up sports again. i've been running between the office and the railway station every day, trying to build up some stamina again. This is going slowly, but it's working. But as I learnt last summer, I doubt that I'd want to go back to long endurance running again. Well, as Menno so succinctly pointed out: "there's never a dull moment in kendo!" 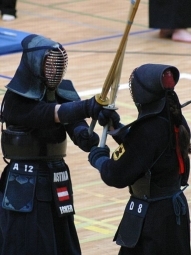 The way I see it, kendo will be beneficial to me in a number of areas. Obviously it's good exercise, there's no doubt about that. It will hopefully also teach me some mental endurance and some much-needed humility. Personally I love the rigor, the tradition and the ceremony, so that's a plus. And physically? I can only dream of ever becoming as fast as some of these folks! One fellow I practiced with would be able to get in five to seven blows for every one of mine. The light footedness! Amazing! There is one snag though. If I ever want to progress beyond the mere basics, wear a bogu and actually start fighting, then I will need to get over myself and start wearing contact lenses. There is no way that my normal glasses will stand up to the blows. So either I purchase expensive, custom sports glasses, or I get my eyes lasered, or I get contacts. Seeing how contacts are the cheapest and least permanent option it's safest to go with that for now. The dojo in Almere, Renshinjuku, is an offshoot of a larger dojo in Amstelveen. There aren't that many kendo dojo in the Netherlands, but I appear to have lucked out with this one! For my taste the dojo has the right level of formality. I was dreading a group similar to my original archery group in Zutphen: no discipline, no rigor, just teenagers running wild. Luckily that is not the case at all! In the dressing room the atmosphere is jovial and informal, but once you go out to the training floor everybody gets serious. I am really looking forward to next week's class.